The Georgia Public Safety Training Center is proud to offer our customized catering packages to suit your needs. From light hors d-oeuvres and snacks, to buffets and barbecues, we can help you plan the perfect menu for your event. Our kitchen is fully stocked with a staff that can accommodate practically any meal request. Barbecue is a specialty here at GPSTC, prepared on our in-house smokers. This is a wonderful option for casual or outdoor affairs at our Pavilion. Many customers enjoy hosting informal grill-your-own hotdog and hamburger luncheons at our Pavilion as well. 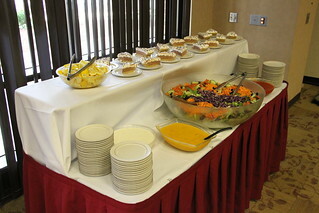 Our Conference Center is the perfect venue for a more formal gathering with plated and buffet options.